Picked her up yesterday with only 8900 on the odometer, completely stock. I also own a 99 FRC but a JSB Z has been my dream car for a long time. Congratulations! Beautiful car. Unmolested with no miles on it. Nice find!! Enjoy it!! Congrats. Don't ignore the heads! Just took mine off on a 7600 mile car and they were in complete disarray. Congrats!!! Love the oem chromes so I kept mine in case i want to flip back one day. Car looks great! Welcome, nice color. Be safe and enjoy the performance of this great car. This forum is a tremendous source of info on the Z06. Use Search feature and ask questions. Congrats! Since you're already a vette owner, I'm sure you've heard mention of the valve drop issues before. Lots of options to choose from to fix the issue and ensure many trouble free years of ownership. Do your u have a warranty? 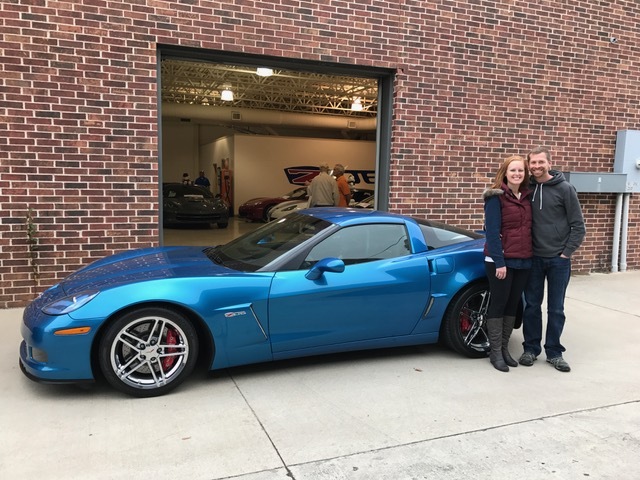 That's a very clean Z06, and you got the best color too Congrats and enjoy it. Be cautious with the throttle at this time of year (cooler pavement and tire temps) until you get to know it. Congrats. great looking JSB Z06! Congrats, great color and welcome to the fray! Beautiful color! Congrats on your purchase! I previously had a C5 Z16 and am jealous that you kept yours plus the C6Z! Beautiful car , I just bought mine and the JSB was my first choice but my first deal fell through so I ended up with a Black Z , which was my solid second choice , that blue color with those chrome rims is AMAZING !! Very nice, congrats. Kinda funny yours has 8900 miles and I recently bought one with 9800 miles. Last edited by z06cop; 12-28-2016 at 09:24 PM. I think yours may have been my first choice, had to settle for this one . Good call keeping it, I don't blame you! Yea sorry about that! Look like you did just as good. Would have regreted it. Nice looking car man. Enjoy!